Cat Plate. High gloss finish is easy to clean. Agway labeled. 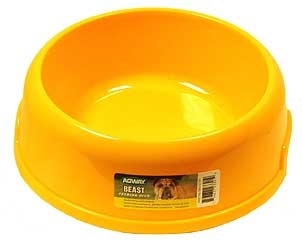 Heavy dog dish with removable rubber base. High gloss finish iniside is easy to clean. Agway labeled. 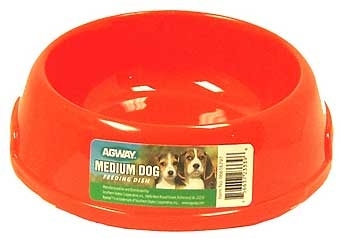 Heavy dog dish with removable rubber base. Outside matte finish resists scratches. Agway labeled. Low height provides easy feeding for kitty. Agway labeled. 6in cat dish. Low height provides easy feeding for kitty. Agway labeled. 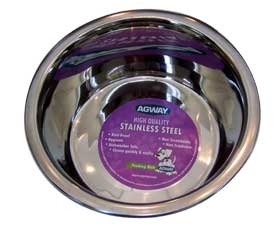 Agway Label Jumbo Single Plastic Pet Dish. 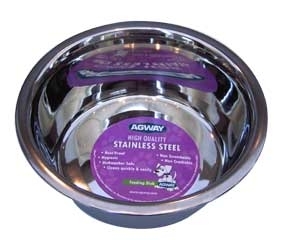 Agway Label Large Single Plastic Pet Dish. 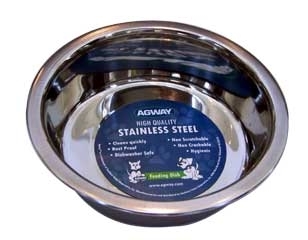 Agway Label Medium Single Plastic Pet Dish. 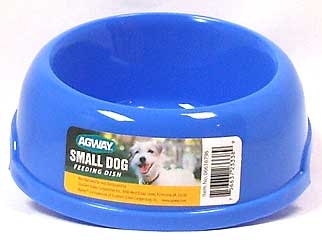 Agway Label Small Single Plastic Puppy Dish. No tip dog dish. Wide non skid rubber base will help not to tip or slide. Special grip handle helps easy pick up of dish while food is inside maintains extra hygiene level. Attractive embossed paw and bone with grip handle. Agway labeled. 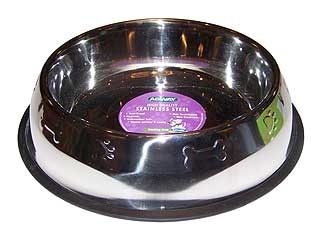 24oz pyramid shape no tip dog dish. Wide non skid rubber base will help not to tip or slide. Special grip handle helps easy pick up of dish while food is inside maintains extra hygiene level. Attractive embossed paw and bone with grip handle. Agway labeled. 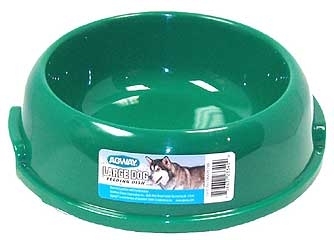 32oz pyramid shape no tip dog dish. Wide non skid rubber base will help not to tip or slide. Special grip handle helps easy pick up of dish while food is inside maintains extra hygiene level. Attractive embossed paw and bone with grip handle. Agway labeled. 8oz pyramid shape non-tip cat dish. Embossed paw and bone with grip handle. Agway labeled. 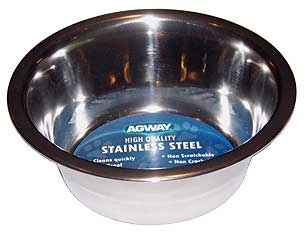 Agway stainless steel high quality dish; is a heavy weight dish with removable rubber base for slippery surfaces. Outside matt finish and inside gloss finish. 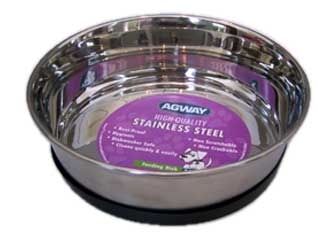 Agway dish has a wide non-skid rubber base that will keep the dish from tipping or sliding. Embossed paw and bone design with grip handle. 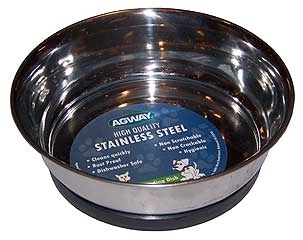 Agway dish has a high gloss finish and is easy to clean. 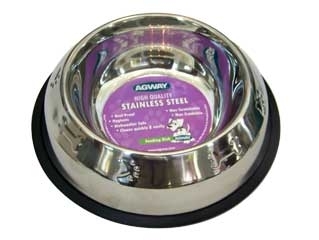 1pt standard feeding dog dish. High gloss finish is easy to clean. Agway labeled. 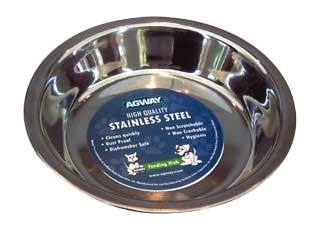 1 quart stainless steel standard feeding dog dish. Highest quality blend of chromium for strength and nickel for durability and finish. 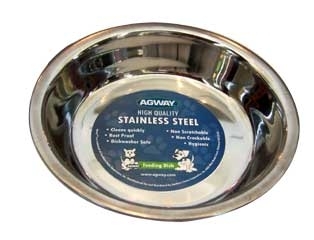 2 quart stainless steel standard feeding dog dish. Stainless steel resist bacteria, rust and scratching. Dishwasher safe. 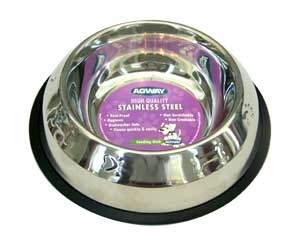 3 quart stainless steel standard feeding dog dish. 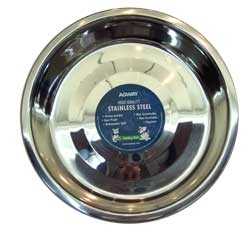 Stainless steel resist bacteria, rust and scratching. Dishwasher safe.